Four High-Quality Instruments Housed in a Sturdy Plastic Storage Case. Teach precision linear measurement, significant figures, and approximation with this unique kit. Give your students concrete experience using industrial tools and various unknowns. 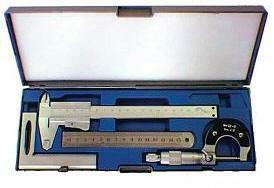 The kit includes a detailed instruction manual, a micrometer, vernier caliper, a knife-edge square, and a ruler. Unknowns to be measured include a 3/4" steel sphere, a round aluminum rod, a plugged aluminum tube, and a rectangular aluminum block.